Natrol Skin, Hair & Nails contains a unique blend of ingredients known for their beauty benefits. 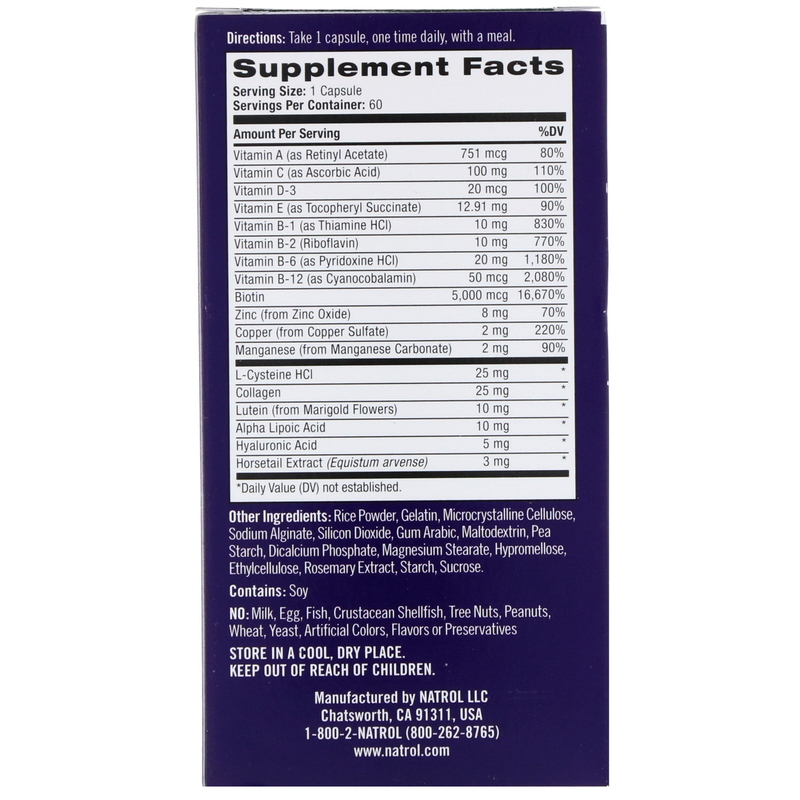 10 mg of Lutein per day is clinically proven to improve skin elasticity and hydration. 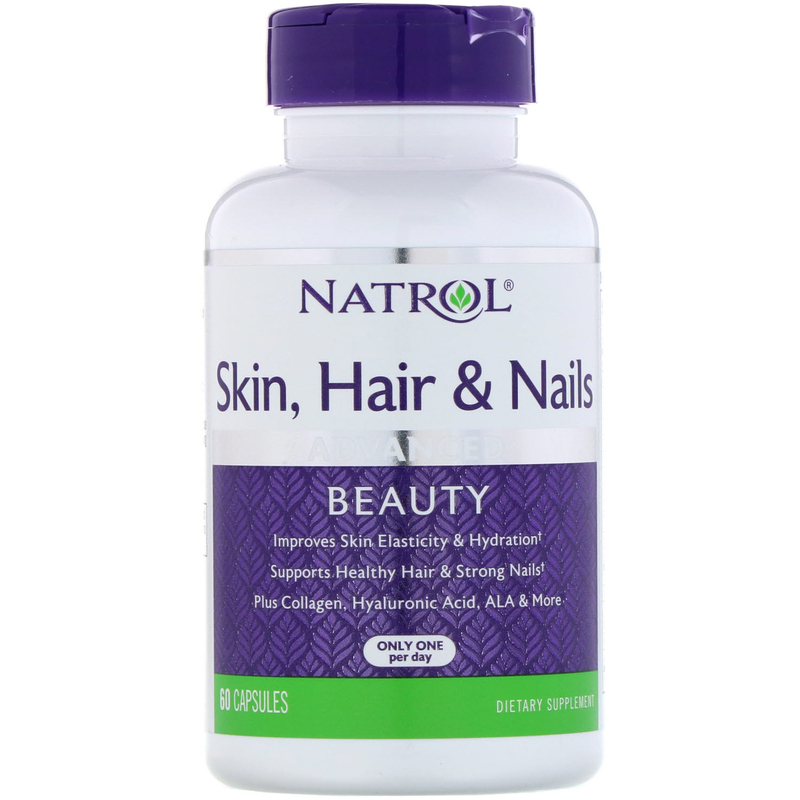 5,000 mcg of Biotin, the "beauty vitamin", promotes healthy hair and strong nails. Collagen and Hyaluronic Acid help keep skin firm and hydrated. ALA and Vitamins A, C and E help protect against damage from pollution and harmful UV rays. The science of beauty combined with natural ingredients to keep you looking and feeling your best. Nourishes, hydrates and protects skin with Lutein, Collagen, Hyaluronic Acid, ALA and Vitamins A, C and E to keep skin looking younger longer. 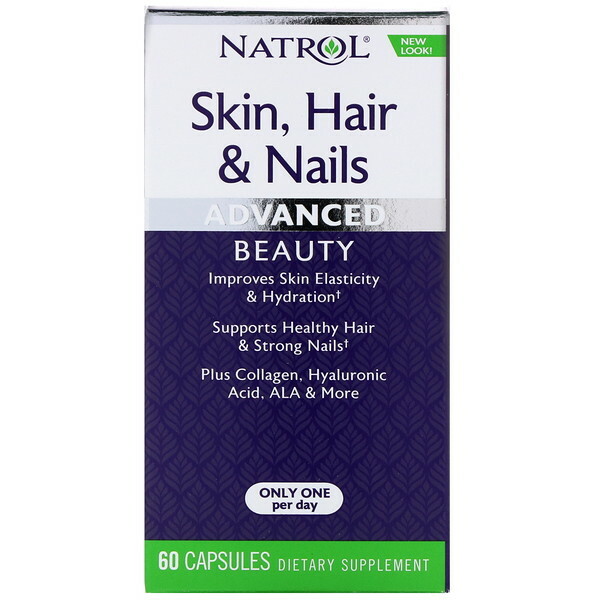 Strengthens and enhances healthy hair and nail growth with 5,000 mcg of Biotin plus Horsetail for structural support. Unlike many other hair, skin and nails products, which can require up to 3 pills per serving, Natrol Skin, Hair & Nails provides a robust blend of beauty ingredients and exceptional value in the ease of just one pill per day. Rice powder, gelatin, microcrystalline cellulose, sodium alginate, silicon dioxide, gum arabic, maltodextrin, pea starch, dicalcium phosphate, magnesium stearate, hypromellose, ethylcellulose, rosemary extract, starch, sucrose. No: Milk, egg, fish, crustacean shellfish, tree nuts, peanuts, wheat, yeast, artificial colors, flavors or preservatives.